Insect rearing is a process. However large or small the rearing system is, the principles of process control can be made applicable. As a result of controlling the rearing process, we have a more reliable, economic, and practical system. 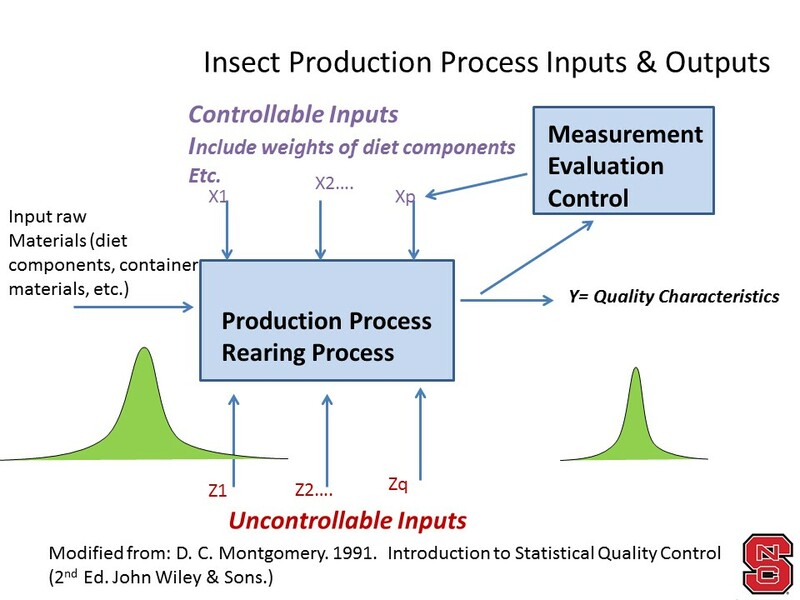 The outcome of process control measures is almost certainly an improved product, which in this case is the insect population that we produce to meet our needs for research subjects, as the fundamental components of pest control systems, as food for other organisms, or whatever else our purpose is in rearing insects. As processes, insect rearing systems are subject to the “rules” of process control. These rules include the fact that data-driven processes can be subjected to analysis of where things may be going wrong and how potential problems can be prevented or minimized. Therefore, statistical process control (SPC) can be a tremendous asset in helping us to organize our rearing systems. As processes, insect rearing systems can best be improved and made predictable (and more quality-driven) by collection and analysis of data in our rearing process. As an aid to explaining how we can visualize our rearing system in a model, I offer the above diagram that I adopted and modified from the Montgomery 1992 reference.